One of the most renowned Coach Trimming Businesses in Cheshire. With over 25 years experience, CC Trim specialise in retrimming of vintage and classic cars and cater for mainstream vehicles including 4x4s. We can accommodate from whole interiors to single seat repairs with a full range of leathers, vinyls and cloths - including up to date alicantara. 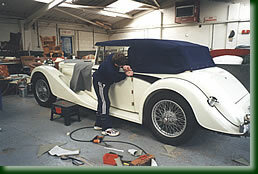 Headlinings, carpets, door-panels, hoods, side-screens and hood bags made to measure on the vehicles. We can supply a range of replacement hoods for most modern convertibles eg. BMW, Golf, Escorts. Ring for quotation/advice/help.